Who doesn’t love a Disney movie? You will feel like a star on the red carpet when you create some star-studded layouts using Checking in All-Star Movies, the newest in Kelly’s series. 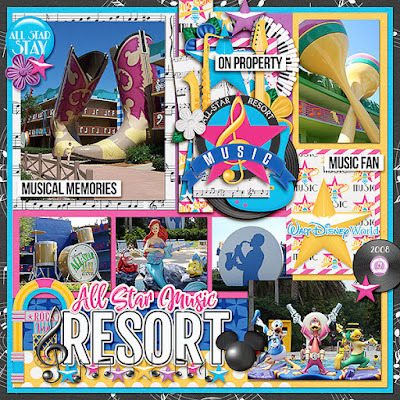 This resorts celebrates the classics like Fantasia, The Love Bug, 101 Dalmatians and Mighty Ducks alongside the newer Toy Story with larger than life icons. 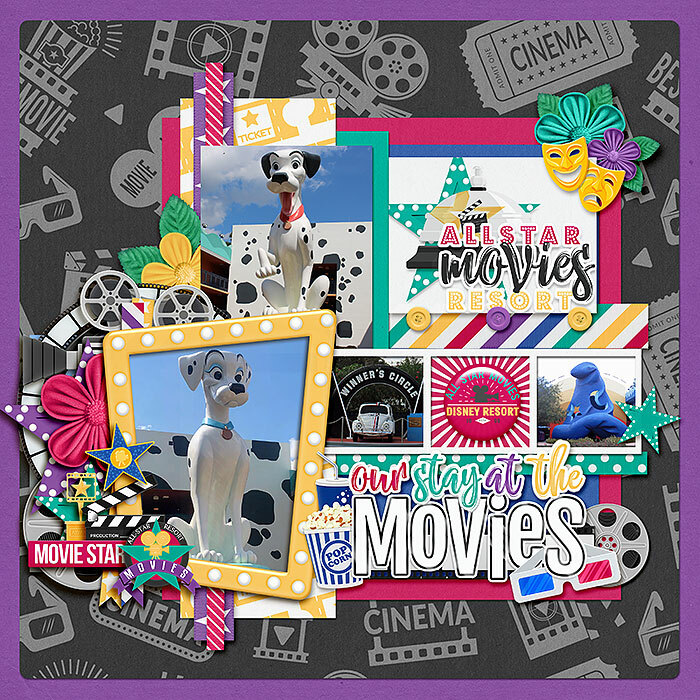 If you haven’t stayed there, this kit is also great for documenting movie nights, Hollywood related themes or theatrical productions. Don’t forget to add on the Oscar worthy coordinating Page Starters, Journal Cards, Word Art, Word Flair and Quick Pages too. Inside this kit are 15 fun, movie themed papers and a full alpha set, plus 49 unique elements including 3D glasses, award, banner, camera, clapboard, director chair, door, heart, film reel, scene, filmstrip, flags, key, light, resort logo, masks, Mickey head, service bell, soda, stars, ticket, velvet rope, walk of fame star, Walt Disney World word art, and much more! You can find them at Lisa’s Blog and Lynn’s Blog. The Remember the Magic series is a great way to appreciate a previously released collection at a deep discount. Kelly has also added some of the most popular elements of a collection to these kits that they not have in their original release. 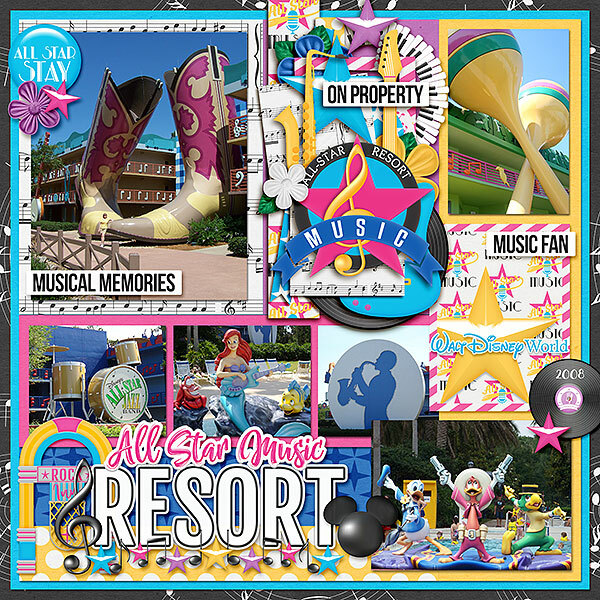 Today’s Remember the Magic Collection is Magical Dream Vacation! To make locating them easier, there’s a new store category called ”Remember the Magic” where these collections will be placed that week. Each product can also be found under their respective category like Word Art or Page Starters. Quick Pages: New to this collection, 4 quick pages. These pages are so extremely helpful for scrapping quickly and easily. Kelly has done most of the work for you! All you need to do is add your photos and you’re done! Birthday Sale at Kellybell Designs! Today’s Remember the Magic Collection is Hollywood Boulevard! Hi! My name is Karen and welcome to my little corner of the digi scrapping world! I've been paper scrapping since the mid 90's and digi scrapping since 2007. I love the creative outlet scrapbooking provides, it lets me share my love of taking pictures with recording my stories and memories.